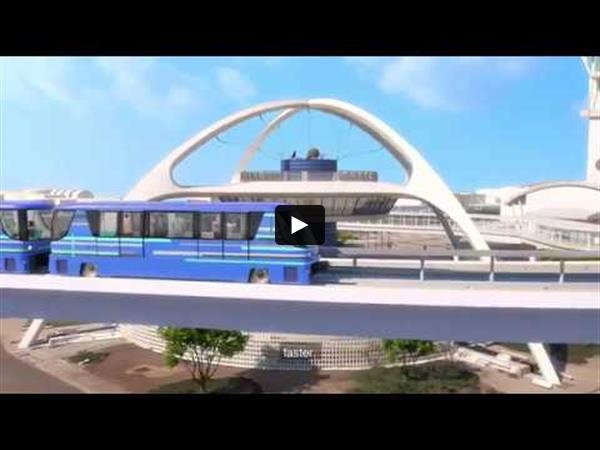 Check out a new video and images for the future of LAX! Agreement Approved to Start Work with Experienced Team; Train Provider has Built APM Systems for 8 out of the 10 Busiest Airports in the U.S.
(Los Angeles, CA) Los Angeles World Airports (LAWA) Board of Airport Commissioners (BOAC) has approved LAX Integrated Express Solutions (LINXS) as the Recommended Developer (RD)and has initiated the first agreement between the parties. 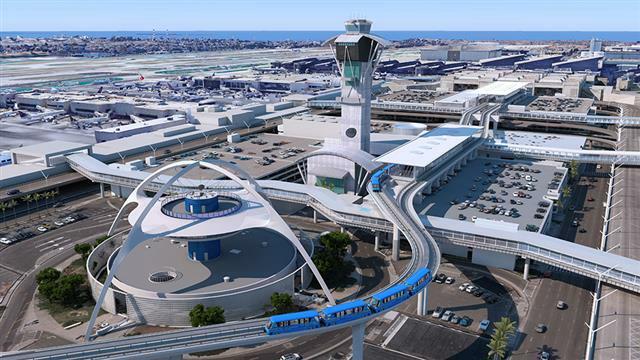 The agreement with LINXS sets in motion the path towardsfull contract approvalby BOAC and the Los Angeles City Councilin April to design, build, finance, operate and maintain (DBFOM) the Automated People Mover (APM) at LAX. "LINXS presented a superior technical proposal for a project that is both innovative and iconic and will also relieve traffic congestion, which furthers our goal of continually improving the experience for our guests," said Sean Burton, President of BOAC. “LAX is taking a major step towards our vision of a Gold Standard Airport with our selection of LINXS as the Recommended Developer for the Automated People Mover,” said Deborah Flint, CEO of LAWA. “We were impressed by their ideas on mitigating traffic during construction, their commitment to hiring local workers, andtheir focus on sustainability throughout the project.We want to get those shovels in the ground so we can continueto create a world-class airport worthy of our world-class city." BOAC approved today an Early Works Agreement with LINXS, valued at up to $42M, which will allow pre-construction activities such as hiring, soil testing, engineering, and furthering design of the APM. Today's contract approval is important to maintain scheduleto complete the project in 2023. "This is a giant leap for the evolution of LAX and public transportation in Los Angeles," said Joe Buscaino, L.A. City Councilmember and Chairman of the Trade, Travel and Tourism Committee. "The People Mover will make arriving and departing from LAX faster and smoother than ever before, creating a much more welcoming environment. The investment in the public infrastructure project will provide a huge economic boost to our city, becoming a source of great paying local jobs." As part of their proposal, LINXS committed to delivering an environmentally friendly project. Landscape will be drought tolerant using California native plants, construction of the maintenance facility will achieve at least LEED Silver certification and they have committed to the use of more solar power than what was required. LINXS' team members have extensive experience building and operating APMs domestically and internationally. LINXS' rail provider, Bombardier Transportation, has been involved in operating numerous APM systems in the U.S. as well as APM systems in Dubai, Heathrow and Munich. LINXS is comprised of firms that have a history of involvement in significant infrastructure projects in Los Angeles and around the country. These projects have helped drive economic development and deliver significant benefits to the local communities. LINXS has committed to partner with LAWA in developing opportunities for local small businesses, creation of good-paying career jobs and fostering economic growth. Convenience, reliability and easy accessibility are key elements of the user experience and are integral requirements for the APM.Trains will arrive every two minutes, have wide doors for easy access with luggage, large windows for viewing, plenty of hand holds and seats for those in need. Station platforms are open air, light-filled and have escalators, elevators, and moving walkways for quick, convenient access to the terminals. Architectural features include a viewing platform of the iconic Theme Building, an Experience LA center with an 800 sq./ft. LED programmable screen and an LED light band that accents the 2.25 mile guideway. LAWA anticipates that the APM will offer a maximum ridership capacity of 10,000 passengers per hour and up to 87.7 million passengers per year. The system will be operational in 2023. The APM is the centerpiece of the Landside Access Modernization Program (LAMP), which also includes a Consolidated Rent-a-Car (ConRAC) facility, Intermodal Transportation Facility-West, and associated roadway improvements. The APM will reduce vehicle congestionin the terminal loop, provide a connection with L.A. Metro's regional transportation system, create new and convenient locations for passenger pick-up and drop-off outside of the terminal loop, reduce emissions, and provide reliable access to the terminals. LAX Integrated Express Solutions (LINXS) is a fully integrated team comprised of Fluor, Balfour Beatty, ACS Infrastructure Development, Dragados USA, HOCHTIEF PPP Solutions, Flatiron, and Bombardier Transportation, and is further supported by an exceptional design team comprised of HDR and HNTB. Bombardier Transportation, the global leader for APM technology and operations, will provide the APM Operating System, including all vehicles. LINXS brings unparalleled experience and expertise in delivering complex transportation infrastructure, including over 50 public-private partnerships in North America with a combined value of over $40 billion. Leveraging our strong presence in Southern California, LINXS is also proud to partner with a significant number of local, small, and disadvantaged business enterprises to deliver the project. LAX is the fourth busiest airport in the world, second in the United States, and was named one of Skytrax’ 2017 Top 10 Most Improved Airports. LAX served more than 84.6 million passengers in 2017. LAX offers 737 daily nonstop flights to 100 cities in the U.S. and 1,386 weekly nonstop flights to 88 cities in 44 countries on 73 commercial air carriers. LAX ranks 14th in the world and fifth in the U.S. in air cargo tonnage processed, with more than 2.2 million tons of air cargo valued at over $101.4 billion. LAX handled 697,138 operations (landings and takeoffs) in 2016. For rel="noopener noreferrer" more information about LAX, rel="noopener noreferrer" please visit www.flyLAX.com or follow on Twitter @flyLAXAirport, on Facebook at www.facebook.com/LAInternationalAirport, and on YouTube at www.YouTube.com/laxairport1. You are receiving this email because of your relationship with Los Angeles World Airports. Please reconfirm your interest in receiving emails from us. If you do not wish to receive any more emails, you can unsubscribe here.